Pure and Applied Mathematics, Volume 109: Operational Calculus, Second Edition. Volume I presents the foundations of operational calculus and its applications to physics and engineering. This book introduces the operators algebraically as a kind of fractions. Organized into three parts, this volume begins with an overview of the concept as well as the characteristics of a convolution of continuous functions. This text then examines the transitivity, associativity, and distributivity of convolution with regard to addition. Other parts consider the methods of solving other difference equations, particularly in the field of electrical engineering, in which the variable runs over integer values only. 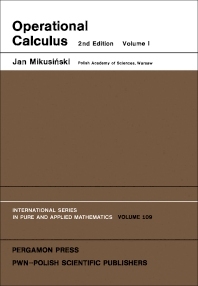 This book discusses as well the solution of differential equations under given initial conditions. The final part deals with the characteristic properties of a derivative and provides the definition of algebraic derivative to any operators. This book is a valuable resource for physicists, electrical engineers, mathematicians, and research workers.